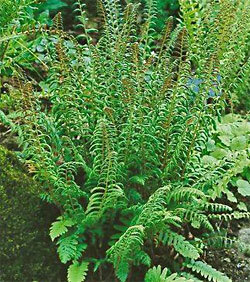 Botanical Name: Polystichum acrostichoides Description: The Christmas fern grows to about 18 inches tall and wide with all of the fronds emerging from a central crown. As the plant ages, it produces more fronds, but the usual number is about 20 on the typical plant. Given good growing conditions, plants produce many more fronds than you'll see in the wild. The base of the frond and the central crown is covered with brown, scruffy scales. The fronds are pinnately compound, meaning there is a central axis with the individual leaflets (pinnae in fern lingo), produced at right angles down its length. The pinnae are 2 inches long, but get proportionally smaller as you move down the midrib. Typical pinnae have a thumb-like lobe at the top, giving it a mitten-like appearance. Ferns prefer shade with indirect sunlight and high humidity. Moist, well-drained soil.